Max357™ supports the body’s daily function by supplying three different kinds of essential fatty acids – Omega 3, Omega 5, and Omega 7.
taking Omega oil supplements on a daily basis. Faulty research has led to public fear about how consuming any kind of fat can lead to weight gain and health problems, pushing us to reduce our overall fat intake – including healthy fats. Food manufacturers have removed fats from processed foods, but replaced them with either sugar or unhealthy saturated fats as way to improve taste and texture. blend of Omega oils has been specially designed to support the upkeep of your body and mind by offering a complementary combination that provides your body the resources it requires to function at optimal levels. Omega 3 fatty acids are recognized as one of the best studied nutritional supplements. More than 11,000 papers attest to many benefits of Omega 3, specifically the acids EPA and DHA. EPA and DHA have been shown to deliver benefits for heart health and brain function and promoting healthy child development. Another type of Omega 3, Alpha Linolenic Acid, is sourced from plants and supplements the effects of EPA and DHA by working to reduce the effects of high blood pressure. Omega 5 is the only known botanical source of Punicic Acid, avery potent antioxidant. Omega 5’s antioxidant level exceeds that of grape seed extract and has shown positive effects on cell repair, digestion, and skin care. 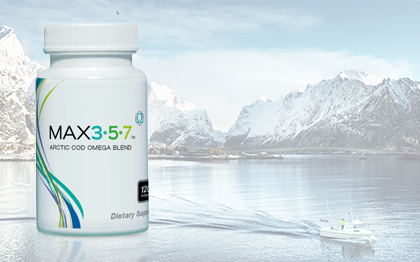 Max357 uses Norwegian cod oil for its Omega 3 fatty acids content. Norwegian wild cod stocks are the largest and most sustainable in any ocean and cod is considered the healthiest fish in the world – one of the best resources of pure Omega 3.